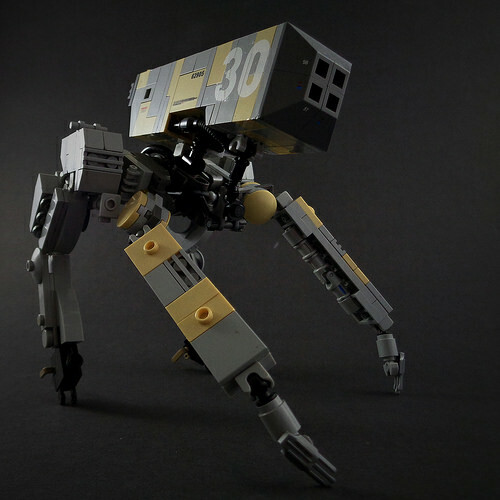 If I were a tank, I’d be scared as heck of this LEGO anti-tank droid. Droids are supposed to be cute: think R2-D2 or Johnny #5. This one ain’t cute. It’s creepy. And menacing. Those long legs remind me of insects and spiders, and I bet those Wolverine claws make an awful skittering noise when it walks. Plus, it has a gun that can destroy a tank! Well-lit, in front of a white background, this contraption could evince a much lighter industrial tone. But Marco Marozzi has chosen to use the nightmare lights instead, and the tanks are rolling out as fast as their treads can carry them.